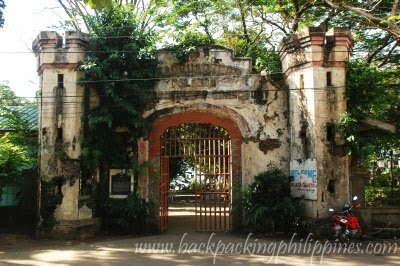 Just beside Palawan Cathedral (Immaculate Conception Cathedral) in Puerto Princesa is a walled park where grim history of American prisoners of war (POW) haunts every visitor curious about the past great war. 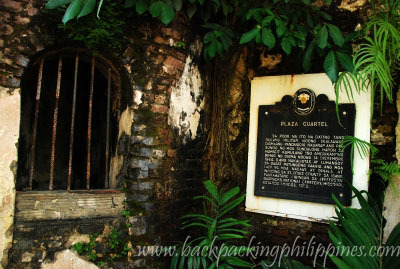 The history of Plaza Cuartel is a must for students of history and every Filipino who wish to know the heroism of many who died and suffered for our freedom. "Sa pook na ito na dating tanggulang militar noong Ikalawang Digmaang Pandaigdig naganap ang pagsunog ng mga sundalong hapon sa humigit kumulang 150 Amerikanong bihag ng digma noong 14 Disyembre 1944. Ilang nakaligtas ay lumangoy sa dagat patungong Iwahig. Ang mga labi ng nasawi ay dinala at inilibing sa St. Louis County sa isang panlahatang libingan sa Jefferson Barracks National Cemetery, Missouri, United States, 1952." the Palawan Massacre Monument, created by one of the POWs who spent time at the Japanese garrison. Japanese soldiers suddenly poured gasoline on and into the American POW shelters and set them on fire with the flaming torches, followed by hand grenades. As the American POWs, engulfed in flames broke out of the fiery death traps, their Japanese guards machine gunned, bayoneted and decapitated an clubbed them to death. Of the American POWs, only 11 survived the massacre. 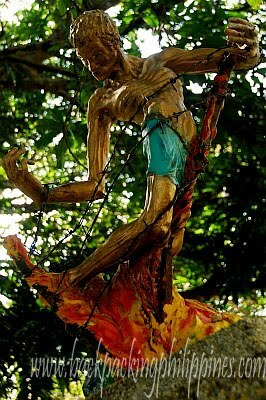 This memorial is by artist Don Schloat, a former POW of the Japanese at Palawan." It was due to this unfortunate incident that advancing army of the returning Gen. MacArthur (who had just landed on October 20, 1944 somewhere near Tacloban, in a place now known as MacArthur Park in Palo, Leyte) decided to free remaining POWs still incarcerated in three POW camps in Luzon were sprung in three separate and simultaneous raids: University of Sto. Tomas, University of Los Banos (UPLB) in Laguna, Camp O'Donnel in Tarlac and the so called Great Raid in Cabanatuan.